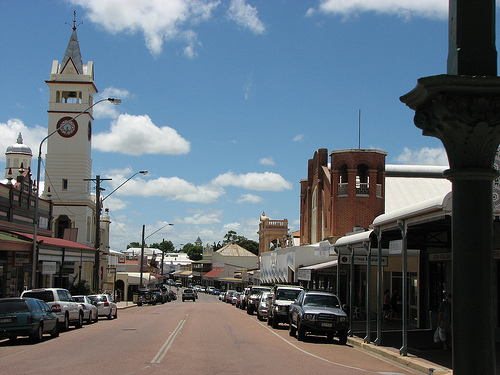 Charters Towers Australia is a historical mining town. 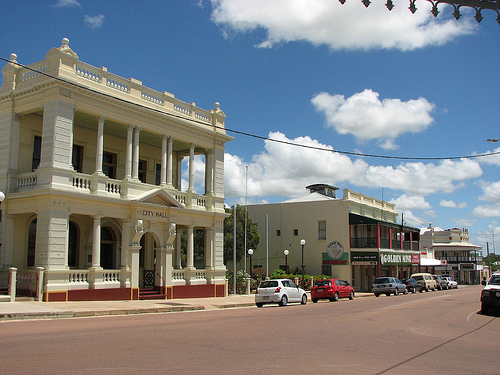 Charters Towers is an interesting historical and modern mining town only 130km inland from Townsville in north Queensland. 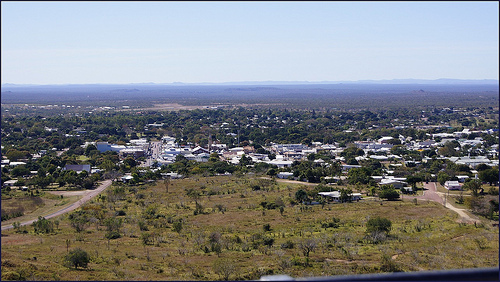 The scenery really changes as you leave behind the coast and arrive in this little hot country town with some fascinating history, great buildings, museums and old mining batteries. But Charters, as the locals call it, used to be nothing like a little country town. 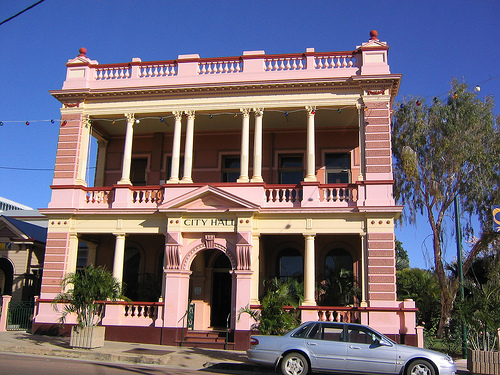 In the 1800s, before Townsville was ever established, it was the second biggest city in Queensland (after Brisbane), with a nickname “The World”. It all started as an Aboriginal boy by the name of Jupiter Mossman was roaming the bush looking for his escaped horses, when he in a creek bed came across a nugget of gold. He took it back to his boss who laid a claim on the land, and the rush was on. Charters grew into a city of 30,000 (that was BIG in the 1800s), 100 mines, 29 crushing mills, and mate, 92 pubs!!! Sixteen of the pubs still remain today, which is heaps for the population of only 10,000 people. Most of the locals are involved in mining industry, as the area around Charters still contains ore minerals. As the techniques improve, the processing becomes cheaper and it is worth to process rock that was left untouched in the old days. Many mining and prospecting companies are in town today and everything in Charters seems to evolve around mining. There has always been a lot of money in mining and Charters really shines its wealthy past. No other town in the area has such stunning old buildings like the World Theatre, City Hall, Stock Exchange Arcade and the old Post Office. Even the police station in town is in a heritage building. 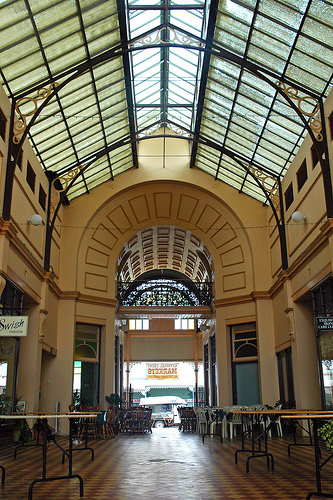 The Stock Exchange Arcade, built in 1887, was the first international stock exchange in Australia. 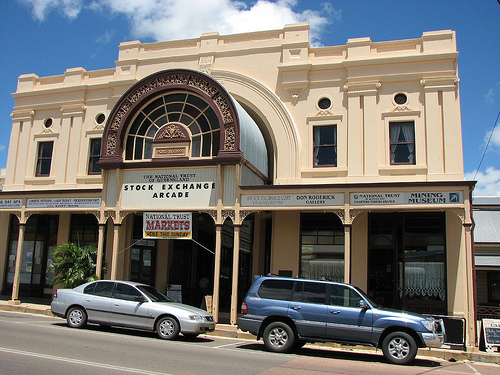 In the end of the arcade is an old gold smelting room – the Assay Room and Mining Museum. 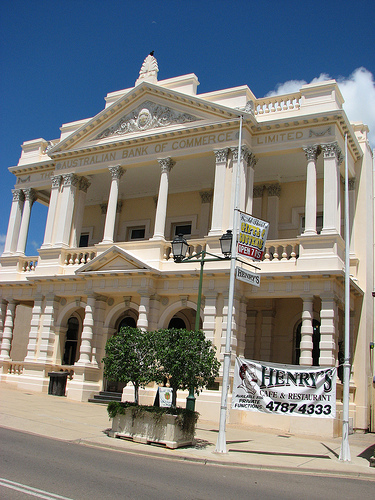 Most of the great buildings are on Mossman Street – the north-southerly main street in the town. The other main street, Gill Street, goes in east-westerly direction and is lined by shops and a few eateries. The beautiful Post Office is on Gill Street, and behind it on Deane Street is the old Miners Cottage Museum. On the Mossman Street is Zara Clark Museum, where you can see some old mining equipment and other memorabilia. 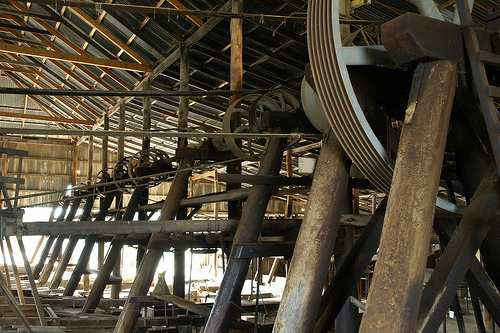 But if you really want to see how mining and processing were done in the old days, go to the Venus Battery. There is a great tour there, where you hear some interesting stories, and the building itself, with all the crushing machines and the old mining gear is well worth a visit. The Venus Battery is in the eastern outskirts of the town, while south is the Lookout – a great place for views over the town, and there is a nice stroll where at dusk and dawn you can see rock wallabies. There is a historical movie every night at the lookout point, and also a lot of signs where you can read about the history of the town, there are some great stories there. If you are into other movies, you can also go and see a movie in the World Theatre; and there is an outdoor cinema, Tors Drive-In in the north-eastern end of the town, on the way towards Townsville. There are a few good places to eat in Charters Towers, like Naturally Good on Gill Street and Lawson’s Bar and Restaurant and Golden Mine Chinese Restaurant on the Mossman Street. Some locals like to go to Park Motel, not your average motel, but an old hotel in a heritage building and the food here is great. There are also many pubs along Mossman and Gill Streets, and some motels along Hackett Terrace. 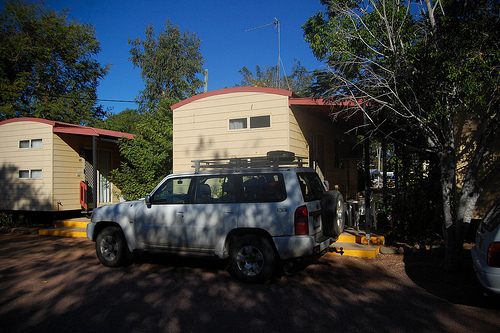 Other places to stay are Best Western Country Road Motel, the Park Restaurant & Motel, Dalrymple Tourist Van Park Hotel and Royal Private Hotel. The town’s parks are Lissner Park in the northern end of Mossman Street, and Centenary Park on the crossroad of Hackett Tce (where you have the main road to Townsville) and Bridge St/Dalrymple Rd that goes towards Gulf Savannah Region. 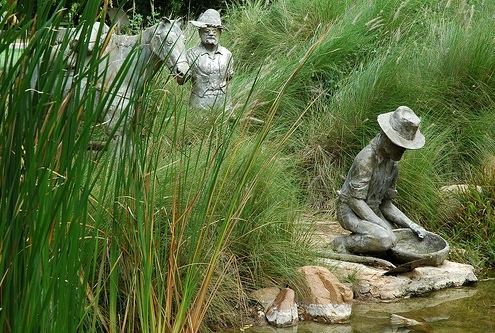 In the Centenary Park is also the statue of Jupiter Mosman finding the gold nugget that started Charters Towers. West along the Hackett Tce you come to Showgrounds, where different events are hold many times a year. 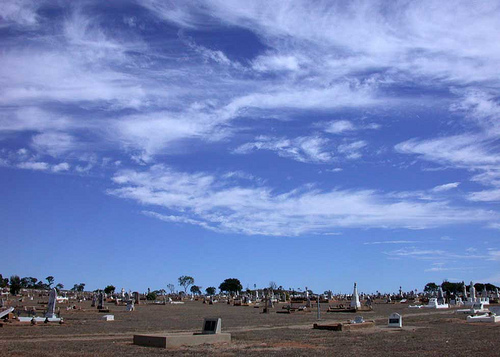 Over the Easter weekend there is a major Rodeo, during the Australia Day weekend is the Charters Towers Goldfield Ashes, and during the May Day weekend there is Australia’s biggest annual country music festival. Here's a Charters Towers map where I have tagged the places that I mentioned on this web page. You can click on the tags to see what places they are, and double-click anywhere on the map to zoom it in and see the places closer. Drag the map to move around, and if you want to see the satellite image with Google Earth, click on "Sat" in the top right hand corner. Last place in the world to go to.